Following our clients purchase of a property in the Brent area of London, Kenwood were called to address a rising dampness issue. 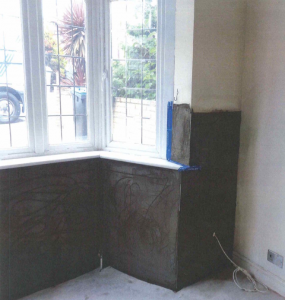 The front bay of the mid terrace home had a defect to the damp proof course allowing dampness to ‘rise’ up. In order to treat and prevent rising damp a new damp proof course was installed. This was done by injecting a chemical into the mortar course of the lower brick work, creating a new moisture barrier. The plaster was replaced using one with salt inhibitors, a measure required against dampness re-occurring. The walls were given a final skim finish ready for redecoration. Now our client can move into their new damp free family home.